Tareq was carrying Mini, his arms wrapped around her chest, so that her hind legs dangled back against his stomach. Her eyes were closed, her pink tongue protruding slightly from between her lips. 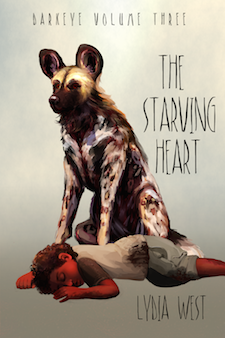 Mhumhi kept one ear turned towards her, listening for her faint little heartbeat- it was still there, despite everything. Tareq was doing better than Mhumhi would have thought. They had been walking for nearly an hour, amidst the sun and sand and wind that raked across their faces, and still he had not complained. He walked between Mhumhi and Kutta and stared at his feet as he slowly trudged on. It made Mhumhi wonder, watching Tareq’s silent little march, what went on in his mind about all this. He had always dismissed the little puppy on the grounds that he was too young to comprehend any of the danger they faced, or what his role in all of it was, and besides that, there was always- there was always Maha to speak to. Now he wondered how Tareq even saw them- as family, or just more in a sea of canine faces, more voices urging him from one bolt-hole to the next. On his other side, Kutta let out a short whistle. She had been doing this periodically, every few minutes or so. Now she added a soft, mournful trill, letting it carry far over the dunes, and then pricked up her ears to listen. “Kutta,” said Mhumhi, and she put her ears back again. “If he comes back, I’ll tear his ears off,” Mhumhi said, and then flinched a little when Tareq turned to look at him. Kutta turned a little away, looking at the sand. “Well, he can’t tell you,” said Mhumhi. They walked on in silence for a moment, feeling that subterranean hum still buzzing under their paws. Tareq kept stealing sideways glances at Mhumhi. They all looked at Mini, who had opened her eyes slightly, still folded in Tareq’ arms. Mini turned her head slightly, and Mhumhi caught a metallic whiff of blood from her fur. Neither Mhumhi nor Kutta said anything. Mini opened her mouth slightly, a little grin. “Tell us what you lied about,” said Mhumhi, but he could not keep the edge to his voice that he’d had before. There was a slurred quality to Mini’s words, a dizzy look in her eyes. “What do you mean? What does he want?” asked Mhumhi. Neither Mhumhi and Kutta said anything for a moment, though the skin on Kutta’s forehead pulled back as her eyes widened. “Not where we’re going,” said Mini. “You mean, the bouda can fix themselves there?” Mhumhi felt the sand shuddering with new trepidation. Mhumhi and Kutta shared a look. “It sounds like something Biscuit would say,” said Kutta. Mini laughed, turning her head up. She seemed to notice the look Mhumhi was giving her and sighed through her nose. Mhumhi glanced at her, and she stopped talking, something dawning in her eyes. He turned back to Mini. She looked up at Tareq. He had a distracted expression on his face, looking out at the sand, as one who has entirely tuned out the surrounding conversation. “Not Tareq,” said Kutta. “Tareq will grow up- won’t you?” she added, as Tareq had swung around to look at her at the use of his name, in an uncanny imitation of Vimbo. “Biscuit?” asked Mhumhi, then suddenly remembered that Biscuit had said something to Vimbo, in hulker, before he’d run away. “We knew it was bound to be a massacre,” Mhumhi said, feeling sour. It had all been Kutta’s plan in the first place; what right did she have now to look so frightened? “I doubt we will,” said Kutta, anxiety still in her tone. Mhumhi, padding slowly beside Tareq, thought that at least now he and Kutta were not tethered to something. And this time he would not stop to talk first. Tareq made a small noise, looking outward. “What is it, Tareq?” Kutta asked, hastening to trot closer to him and look up. “That,” said Tareq, shifting Mini to one arm to point. They all stopped for a moment. They had just come to the top of the curving crest of a dune, and now down below them was a steep slope leading in to a kind of valley. Far in the distance were the dark shapes of mountains. Directly below them the ground was flattish, and Mhumhi could see numerous little shapes. “Trees?” Kutta looked at him quizzically, and he recalled that her only experience with them was seeing the tall metal ones from the train. They went down, Kutta still sniffing warily despite his reassurances. “They smell strange,” she said. They did indeed smell strange, but not unpleasant, at least in Mhumhi’s opinion. It was a very light scent, soft and fragrant. Mini opened her eyes slightly. “What’s a flower?” asked Kutta. “I don’t know,” said Mini, and closed her eyes again. Mhumhi went and sniffed at one of the stubby trees, pawing at it a little. It crackled dryly and released more of the scent. “Ah, look!” exclaimed Kutta, and she suddenly dashed forward. Mhumhi went after her by instinct, leaving Tareq a little ways behind. Kutta was heading toward a large dark object- a stone outcropping jutting out of the earth. Above it Mhumhi saw a flicker of movement- a cloud of tiny insects, all whirling around and around one another. Kutta was backing up now, blinking hard as some had started landing on her eyelids. “How can they live out here?” she asked. Mhumhi looked closer, wary of the swarming insects, and sniffed. “Really?” Kutta came forward again, sniffing loudly. In the shadow under the rock there was indeed a little pool, a tiny thing, barely big enough for them to dip their noses into. The insects were swirling over it, catching the light sometimes like motes of dry dust. Something slimy and life-smelling was also growing on the underside of the rock, just over the pool. They stared for a moment at the silent whirling cloud, the shadowed puddle, and the moist greenness. Behind them they heard Tareq trudging quickly over the soil to catch up. Kutta’s cry reflected Mhumhi’s surprise, for something had just come crawling from around the other side of the rock. Mhumhi’s only point of reference to compare it to was a rat, for it was roughly the same size, though skinnier, and without fur. It had interlocking scales instead, and yellow eyes. It turned its head to look at them with only one. “Lizard!” cried Tareq, and he dropped Mini and ran towards it, hands outstretched. The lizard darted back around the rock. “Oh, Tareq,” said Kutta, and Mhumhi gave a soft snort. They had both started when the lizard had run- the quick movement of it was very hunger-inducing. “Ouch,” said Mini plaintively, from the ground. She paddled forward for a second on her front paws, her rear legs sliding on the sandy soil. “Tareq, pick her up,” Mhumhi said, and Tareq came back to her, sticking out his lower lip. “We’ll play with lizard another time,” Kutta said, moving to wag her tail against him. Mhumhi noticed that the lizard had come back around the rock once Tareq’s back was turned. It raised itself slightly and snapped at the little insects. Mini, tucked securely back in Tareq’s arms and slightly worse for wear, gave another little sigh. Mhumhi made no response, but he thought to himself that the tiny little pool was lovely in its own way. It very nearly felt like an answer when the nearby little trees shivered, and suddenly there was a pulsing buzz in the earth. Kutta whined. The buzz came again, and they saw all the trees in front of them shiver as it passed. “It’s that way,” said Mini, unnecessarily. They went forward, all a bit spooked, towards the distant mountains. The terrain changed as they moved forward. Now the little trees became more frequent, and denser, and there started to be a sort of thick sharp grass growing at their feet that was a struggle to walk through, especially for poor Tareq, who had to hold Mini in his arms instead of balancing himself. Eventually Kutta took pity on him and took Mini by the scruff. Her rear legs dragged on the ground and her tongue was sticking out again. The buzzing waves became more frequent as they went forward, until Mhumhi had the distinct feeling that someone really was trying to communicate with them, leading them onwards. It was not long before they saw the building. Mhumhi thought that it would not have looked wholly out of place in the city. It was somewhat tall, with rows and rows of windows, putting him somewhat in mind of the hotel. The front part of it was a little odd, though- it had a shorter area with domes on its roof, and tall windows with colored glass. “Neither do we,” Kutta pointed out, but softly. Tareq said, “I’m thirsty,” and looked meaningfully at the building. “All right, we’ll go,” said Kutta, reaching for Mini again. The little dog had gone limp, and allowed herself to be picked up again, shutting her eyes. “It’s his fault he’s not here, not yours,” said Mhumhi. Mini merely swung in Kutta’s grip, saying nothing, eyes squeezed shut. As they approached the large glass doors in the front of the building, they slid open noiselessly. A trickle of cool air came from within, washing over them. “Let’s go! I’m thirsty!” cried Tareq, eyes wide and invigorated. He ran ahead of them. Kutta made a garbled noise around Mini’s scruff and dragged her quickly after him and through the doors. Mhumhi ran a few steps after them, and then hesitated. He turned his nose up, looking at the high windows. There was a flicker of movement in one, and then it was gone.